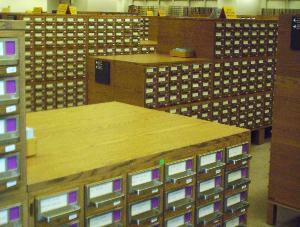 Archival copyright registation and renewal records are maintained in the Copyright Office at the Library of Congress on index cards filed in drawers such as these. Modern records are maintained electronically. Older records are also maintained in log books and full-sheet registration forms and renewal forms. The most authoritative source of information about whether particular copyright registrations have been renewed is information stored and maintained by the Library of Congress. Below is the top part of a log page recording three registrations taken out in 1940. (The second item, registration 220621, a song titled “Lola” by C. Arthur Fifer, is used as an example on plagiarism and similarity on a Citations and Case Summaries page on similarity elsewhere in this web site.) The manner in which registrations numbers are found on these pages is by looking at the stamped numbers in the top left area of the page. “220” is the number of thousands (thus, all registrations on a page so stamped must fall within 220,000 to 220,999) and “6” is the number of hundreds within the particular group of thousands (thus, in this combination, all registrations on this page must fall within 220,600 to 220,699). These pages are bound within books which can be inspected at the Library of Congress. below: an enlargement of the renewal information area for registration 90,922. More visible in the enlargment than in the fuller illustrations is the word “Renewal” pre-printed on the form. Keeping in mind where “Renewal” appears in the box for each listing on the form, you can see that there is an empty space under “Renewal” for registration 90,929, which is “Lola Fox Trot,” a derivative version of the same “Lola” by C. Arthur Fifer which was registered as an unpublished musical composition ten months earlier (see registration 220,621 on the first illustration of this page). The illustrations pages on this web site for copyright renewal, foreign and derivative works contain images from the Catalogs of the entries for several works. Among them: The Last Time I Saw Paris (the movie and the song), Dodsworth (book), Road to Bali (movie), Heavenly Daze (movie), The Case Book of Sherlock Holmes (book), and I Cover the Waterfront (book). When conducting an investigation of copyright registration and renewal using the Catalogs, two separate steps are undertaken: (1) a listing for the work is sought in a Catalog published near the time that the work was registered; (2) a listing for the work is sought in the “Renewals” section at the back of a Catalog published near the time that the work was eligible for renewal. The second of these searches is usually conducted in one or more Catalog volumes dated 27 and 28 years after the Catalog that contained the listing for the original registration. If you are interested in the copyright status of a motion picture, you’re in luck. Rather than having to search in multiple volumes of the Catalog, you can turn to “cumulative” listings that have already been collated to match renewal listings to the listing for the original registrations. Two private-industry firms have prepared reference books that eliminate much of the “leg work” that you would otherwise have to do. On the above image: dates in red are renewal dates; serial numbers in red are renewal numbers. “N.R.” indicates that no renewal was found in the renewal registrations. Those seeking the reference books should know that they are: (1) The Film Superlist series. The separate volumes are titled Film Superlist: Motion Pictures in the U.S. Public Domain and divided into the same ten-year and multi-decade groupings as the Cumulative Copyright Catalogs prepared by the U.S. Copyright Office. The series was originated by Walter E. Hurst (publishing through 7 Arts Press) and continued after Hurst’s death by D. Richard Baer (publishing through Hollywood Film Archive); (2) Motion Picture Copyrights and Renewals 1950-59, by David Pierce, published by Milestone & Co., 1989. This second company issued just the one volume. The image with the red addenda (immediately above) is a mock-up made by the copyrightdata.com editor, and although it resembles the listings in the above-named books, this image was not copied from either of those publications. 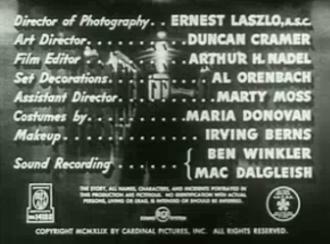 The red text was added electronically to an image scanned directly from a copy of Cumulative Copyright Catalog, Motion Pictures, 1950-59 (published by the U.S. Copyright Office). Most listings in the Catalog of Copyright Entries and the Cumulative Copyright Catalog are individual listings of one title with one registration. For the above two-image illustration, I chose a listing with multiple registrations. (It’s one television series with hundreds of weekly episodes. The illustrations cut short the list of episodes early in the alphabetic list.) In this way, I provided the largest number of collated listings possible in the smallest amount of space. Those consulting the actual Film Superlist and Motion Picture Copyrights and Renewals books will find that each separate work takes up the better part of a column inch of space on the page, in that almost every listing has its own claimant, length and format information in addition to title, date and registration number. Would you like to have made available a computer-based means of obtaining registration and renewal records? Copyrightdata.com is planning such a project. Keep checking back to this space to learn of the process, OR, if you are a potential heavy-user able to guarantee you would pay to obtain the records, contact Copyrightdata.com. The time for an electronic searchable database of copyright registrations and renewals has come. Readers of the illustrations page on derivative versions saw a poster for the 1950 release March of the Wooden Soldiers, which is the 1934 movie Babes in Toyland under another title. 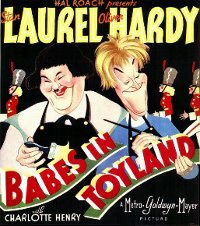 Copyright was made in 1934 under the title Babes in Toyland. Copyright registration was never made under the title March of the Wooden Soldiers, which could mislead parties unaware of the title change who look in the copyright records only under the later title. Twenty-eight years after the copyright was undertaken, the registration came up for renewal. There had been a change in ownership in the rights to the movie during those years, and the resulting confusion led two separate parties to each renew copyright. Metro-Goldwyn-Mayer (MGM) had distributed the movie on behalf of independent producer Hal Roach, and had copyrighted the film on Roach’s behalf in that capacity (much as a book publisher registers copyright for authors). MGM’s distribution contract ended a decade later. Ordinarily, Roach would have been responsible for copyright maintenance thereafter, but Roach was bound by an additional contract: to secure the right to use Victor Herbert’s popular 1903 operetta Babes in Toyland as the underlying work for his movie, Roach accepted a timetable by which ownership of the movie would be turned over to heirs of the creators of the operetta. Several leases and sales of various rights to the underlying operetta and the movie followed thereafter. At different points during 1962, two renewal registrations were filed for the 1934 Babes in Toyland, one of them by MGM, neither by Roach. MGM recognized its mistake before the renewal window closed with the end of the twenty-eighth year of copyright on November 28, 1962. Researchers using only the Catalog of Copyright Entries see only the two listings for the two renewal registrations. (Images of these two listings are reproduced above). The Catalogs don’t indicate retractions nor records accepted in error. However, the files of the Copyright Office provide vital supplemental information. In a subsequent filing, it became part of the Copyright Office records that MGM signed a quitclaim to Auerbach Film Enterprises, Ltd. 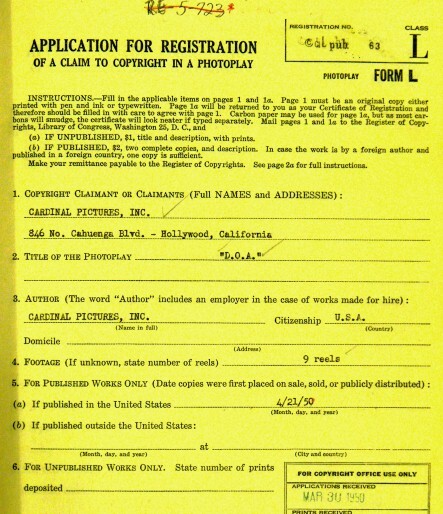 The quitclaim covered MGM’s “right, title and interest in the renewal of copyright and any extension of copyright in the motion picture photoplay entitled BABES IN TOYLAND (also known under the title THE MARCH OF THE WOODEN SOLDIERS) which was originally copyrighted in the name of Metro-Goldwyn-Mayer Corporation, […].” The consideration received by MGM for assigning any such rights it may have had was “the sum of Ten Dollars ($10.00) and other good and valuable consideration” — which suggests that MGM didn’t regard themselves as having any rights to offer other than a clearing-up of confusion. The change in title was important to reflect in the record. On November 26, 1975, E. Fulton Brylawski, writing on behalf of the Law Offices of Fulton Brylawski and the then-rights-holder of 1934 movie version of Babes in Toyland, wrote the Register of Copyrights asking that the assignment records be revised to reflect that “the picture has been re-issued and distributed under the title MARCH OF THE WOODEN SOLDIERS”. Thereafter, anyone searching the assignment records would find cross-references from one title to the other in the Copyright Office files. What if a party without rights is the only one to file copyright renewal? In the above events, the filing of a copyright renewal by a party without legitimate rights turned out not to put the work into the public domain — because there was another renewal registration. (Auerbach, in the language of the quitclaim assignment, “has succeeded to all the rights and interests of Hal Roach Studios, Inc.” relevant here.) The question arises: what if MGM had been alone in filing a renewal? That renewal would have been just as invalid as was the one which MGM itself disavowed October 29, 1962. Therefore, researchers interested in determining the copyright status of works should look out for instances where there is but one renewal registration with that one registration being defective. The Citations and Court Summaries section of this web site provides a summary of a court decision where the single renewal filed proved to be invalid. In Alice T. Yardley v. Houghton Mifflin Co., Inc., the copyright renewal was described as “wholly void and of no effect” because the registrant was not entitled to renew. The sheer number of registration forms and renewal applications received by the U.S. Copyright Office has long been so high that it is understandable that, for the employees of the Copyright Office, the task of accurately processing all of this paperwork can be daunting. Given that the records of the Copyright Office are the premiere resource for those seeking to determine the copyright status of published works, it is important that they be accurate. As demonstrated on another page of this web site (see the illustrations page on copyright renewal and read the passages concerning Road to Bali), the Copyright Office will send correspondence to an applicant seeking to file a copyright renewal where there is the legitimate reason to refuse the application on grounds of it being untimely. However, in one instance in 1978, the Copyright Office processed and recorded a copyright renewal — and then months later corrected their records to reflect that the renewal had not met the legal requirements for one. Other than the markings at the top margin of the page, everything written on this form is as it was in 1950. 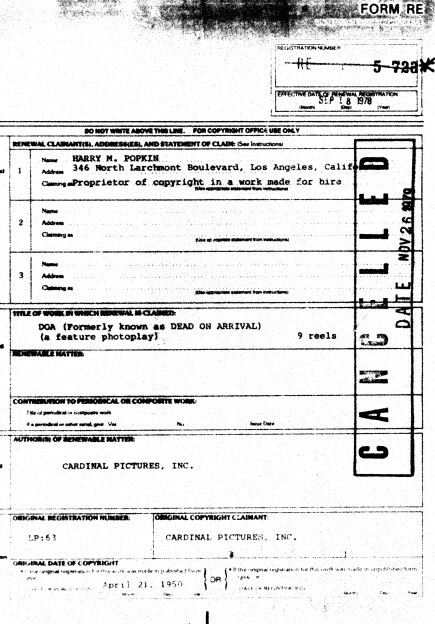 The copyright proprietor typed in the title of the work, the firm’s name and address, and the length of the movie (nine reels corresponds to the 83 minutes the film takes to screen). The name and the address of the intended recipient of the copyright certificate were typed at the bottom of the page (and have been cut from this image to conserve space). The Copyright Office in 1950 stamped in the registration number (top right corner), the date that the application was received, as well as the dates that the Copyright Office received copies of the work and of the description (these latter two stamped dates have also been cut off on this web site). On item was added in 1978: the marking at the very top of the page, where a member of the Copyright Office staff added “RE 5-723” to indicate the 1978 renewal registration form which cross-references the original 1950 application. After “RE 5-723” was written in, it was crossed out in red, as the renewal does not apply. The copyright proprietor seems to have presumed that the copyright term went into effect in 1950. Under the rules in effect until 1978, a work with a publication date of April 21, 1950 (the date on the 1950 application) would have had to be renewed between April 21, 1977, and April 21, 1978. Under the rules which went into effect January 1, 1978, all works with copyrights that commenced in 1950 had a renewal window of January 1, 1978, to December 31, 1978. The renewal form submitted by the copyright proprietor (reproduced immediately below) was stamped by the Copyright Office with the effective date of September 18, 1978. This would have made the renewal valid had there not been conflicting circumstances. In the case of D.O.A., the fact that the copyright notice gave the year as one year early meant that any 1978 renewal attempt was an attempt made too late to be good. The fact that the copyright term had to be measured from 1949 apparently escaped the Copyright Office employee who first examined the application and the records. Thus, the renewal application was processed and was assigned number RE 5-723, as has been stamped in the top right corner above. At a late time, this was crossed out. Also at a later time, the form was marked with a huge stamp reading “CANCELLED.” The date of cancellation is indicated as fourteen months after the renewal was allowed to go into the record. In a detail of the renewal form reproduced in an enlargement below, you can see that the “original date of copyright” was typed in by the copyright proprietor as April 21, 1950. Just below, by hand, the Copyright Office wrote in “In notice 1949”. In this particular case, the personnel of the Copyright Office adjusted the records to accurately reflect the copyright status of the work in question. However, persons interested in conclusive answers about the copyright status of a particular work have to recall that not in every case will the Copyright Office personnel recognize the significance of small pieces of information that can have a decisive bearing on the copyright status of a work. Furthermore, under the judgements made by courts, the Register of Copyright should conduct his duties such that “his powers are similar to those exercised by the Postmaster General in admitting articles into the mail” (as stated in a 1941 court decision). For the above reasons, persons investigating the renewal status of a work such consider whether (1) the work was published (not performed but published) prior to the date declared in the registration, (2) the renewal was filed on behalf of a party with a legitimate claim to the subsequent copyright term, (3) other considerations relevant to the particular media or particular work. If you’d like more examples of works copyrighted in one particular year although the year in the copyright notice displays a different—earlier—year, take a look at a page devoted to that, illustrated by listings from the Catalog of Copyright Entries. These additional reports of instances where the year in the copyright notice is earlier than the registration year, along with the renewal information, are provided on this supplementary page: Copyright renewal records for 1950s Warner Bros. cartoons with too-early years in copyright notice. The nearest thing to an effortless search for copyright status on a work is to have the Copyright Office do it for you. This is an expensive option, and the backlog of work faced by the necessarily-limited staff at the Copyright Office can result in a long wait for your results. The benefit to a Copyright Office search is that their personnel has access to the most records — far more than those at college and major-city public libraries — and that these are the original, complete records, so a search has more facts to draw upon. The staff works with the records throughout their work days, so they are well-versed in the intricacies of the records. The illustration immediately below is the text from a Copyright Office search report. A vast amount of blank space below the text has been omitted from this image. The particular movie reported on in this search is one of the fourteen Sherlock Holmes films starring Basil Rathbone as Sherlock Holmes and co-starring Nigel Bruce as Dr. Watson. Sherlock Holmes and the Secret Weapon is among the four Holmes films starring Rathbone and Bruce that is widely available on low-cost video because it entered the public domain. The Copyright Office denoted the fact of the copyright registration citing the underlying work upon which the screenplay was based. The particular short story named was first published in 1903, and consequently has entered the public domain in both the United States and the story author’s native England. The illustration below is the bottom of the search report form reproduced above. This wording concerning “[r]egulations… prohibit… giving legal opinions or advice” appears at the bottom of a substantial number of pieces of Copyright Office correspondence, including all of the (two-hundred-plus) search reports that this writer has seen. As reported in the illustrations page on publication, most works of Emily Dickinson were not first published until years after her death (decades later in some cases), a beloved song by Irving Berlin waited twenty years for first exposure, and large sections of Mark Twain’s Adventures of Huckleberry Finn were not published until 112 years after creation. For this reason, remember in researching copyright registrations and renewals that the time frame for the records may not match that of the work’s creation. All hyper-links mid-page other than those that take you to a location elsewhere on this page, will open in a new window. No links within the main body of this page will load entirely new content within this window. You don’t have to fear losing your place within on this page.